Santa stuck going down the chimney? 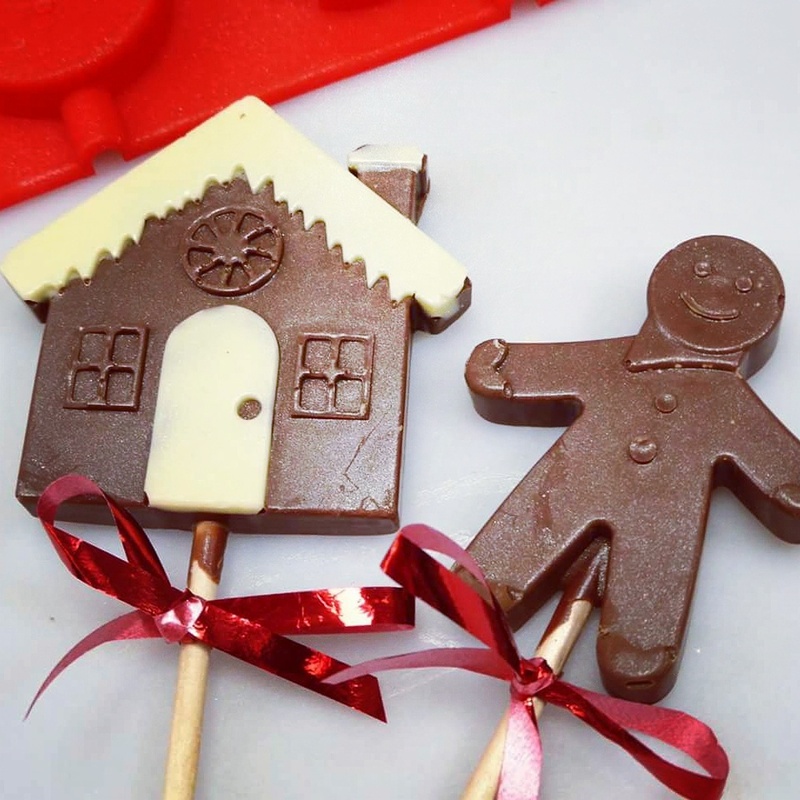 Gingerbreadman and little gingerbread house mould! Snowman and christmas tree! and a waving Santa! They are currently on offer for £4 on my little website. They are very easy to use, just add melted chocolate. Allow to set and pop them out. Ps. they are oven safe too if you want to bake shortbread or make crayons, soaps and other crafty delights. They are also perfect for making your own dairy free chocolate. Just on time for Oktoberfest. Is this not perfect? A delight for a beer AND chocolate enthusiast. Cheers! Unfortunate place for the stick. 😂🙈 I swear it did not cross my mind till someone commented on our Facebook page. To be fair, where are we going to place the stick? Haha! Although someone did mention that it might be perfect just like that for a hen do. Yikes. Ps. the only reason why we are talking about this very festive mould is because we have been sending out quite a few festive orders. If you have that .. ALREADY?! look in your head and on your face. I know, I know … there is some folks out there who is just very organised. Admirable! Boy oh boy. It’s the weekend and we have glorious weather! Hello sunshine 🙂 Freya is about to turn 9 months, old enough to coo and stare at animals but not very appreciative of them yet. Therefore, we cannot justify paying an entrance fee to visit farms or amusement parks just yet. There’s a farm right in Nottingham city centre which we enjoy going from time to time. Free to enter and open every day. There’s piggies, often found rolling about in the mud. Moo! I love them, they were so friendly. and a matching chocolate cow. If I am not mistaken, this is the curly haired Angora sheep. Bubble wrap. Are you one for popping one bubble, and then the other and the other until they aren’t any left? Guilty as charged. Its just very satisfying. Let me share this cool baking mould which has a bubble wrap effect design on it. I really need to try make shortbread in them or something as they are oven safe too. Its available as a medium 4 bar or large 3 bar mould. In milk, dark and white chocolate 🙂 Sharing one made by our lovely customer, these are made by Truffolicious. If you click on the image below, it will bring you to their FB page.